Taking control of your finances can be confusing, if not downright daunting. The best thing to do is learn from others with lots of experience under their belt. That’s where the best personal finance books of all time come in. Some of the best financial planning books are written by journalists, economists and millionaires, all with the intent to uncover how we can make more money throughout our life. The books below range from the specific to the broad, but they are all focused on ultimately making you more money. So, grab a coffee or tea, one of our best personal finance books, and get to reading! For more amazing ideas on how to make money, check out our extensive guide. 1. The Online Survey Bible: The Ultimate How-To Guide for Making $1,000s Online! Edward Steiger is a former market research recruiter who has studied focus groups and paid surveys inside and out. His book, The Online Survey Bible, is for people who want to make easy cash taking surveys online. Steiger guides you through how to choose online surveys, which type of information and answers you should be sharing, and how to find financial success using his strategies. Personally, he has taken over 600 surveys and made over $100,000. One such online survey for making money is SurveyJunkie, one of the most well-known survey sites of the bunch. SurveyJunkie pays you to take surveys about products and services, so companies can fine tune the products and services they are currently making. Click here to sign up for SurveyJunkie and start earning money by taking surveys. The book 101 Free Money-Making Apps by Jason Wuerch is essentially a detailed list of all the different ways you can make money using just your phone. Some of the ways you can be paid on your phone include: watching videos, taking surveys, completing short tasks, investing, working out, shopping online, and mystery shopping. For example, the Long Game app is a savings account app, but one where you can win cash and crypto rewards every time you save and earn chances to play. Start making money right now using just your phone! Click here to get 300 bonus coins for Long Game Savings and start earning rewards for making smart financial decisions. David Putrino’s Hacking Health is a must-read guide for anyone interested in health in the tech world, in starting a health-tech startup, or in health-related technologies. For example, many tech and health combinations are already on the market, such as HealthyWage, an app that awards people prizes for weight loss challenges and contests. HealthyWage is a great money-making tool that will also help you meet your weight loss and fitness goals. Check out our HealthyWage review for more information. There’s also Sweatcoin, an app that pays people to walk around outside. Click here to read our Sweatcoin review and find out more about how this app works. Both these apps combine tech features with health goals. This combination is what Putrino addresses in his book, as a veteran in the world of HealthTech and Telemedicine. Putrino helps readers understand how tech is impacting the health care system as we know it. Not only that, but he outlines how tech-health products are revolutionizing the industry and how you can make money in that niche. It’s essential reading for entrepreneurs, scientists, clinicians and professionals looking to make money while improving health. Click here for a wealth of tips and strategies to earning passive income. Do you work at home or stay at home during the day? Then this is the money-making book for you. Make Money Online in 2019 by Brandon Herrera is a comprehensive guide on how to make money from home in ways you might not have imagined. Herrera outlines affiliate marketing strategies, network marketing, podcasts, Facebook marketing techniques, and more. For example, a money-making app that you can use at home is Ebates. When you shop online, Ebates gives you cash back on items you would buy anyway! It pays to know all of these little tips and tricks of making money online! Click here to sign up for Ebates today and start getting cash back on your online purchases! For those who want to turn an Airbnb side hustle into a profitable business, this is the book for you. Not only is his information born from experience and success, but the author has also read all the other Airbnb books on the market and gone above and beyond all of them. Daniel Vroman Rusteen’s book, Optimize Your Airbnb, was born from wanting to help others maximize their hosting potential. Rusteen has gone from employee to guest to host to Superhost to starting an Airbnb property management company. In his book, he talks about how to optimize your listing to achieve a high search rank, how to leverage tools to automate up to 80 percent of your Airbnb duties, how to design your interior without professionals, how to navigate a slow season, and more. Interested in becoming an Airbnb host and earning money by renting out your property? Click here to get started! This is a book for people who love to make money with a good side hustle or are currently Avon representatives. Edwards’ Avon Selling Secrets is a book on how to make money the right way with Avon. Inside are tips and tricks for how to increase your sales and gain more customers. It’s a guide that includes marketing strategies to take you from just a few customers to hundreds. If you’re looking for one of the best personal finance books tailored to a certain selling niche, then this is the book for you. Whether you’re already an Avon rep or want to become one, this book can help give you the tools to turn your sales into massive sums. Click here to complete the quick online form and join Avon today! Said to be one of the best books on making money for Millennials, I Will Teach You to Be Rich by Ramit Sethi combines a practical approach with a non-judgmental style of delivering personal finance truths. The book covers the four pillars of personal finance — banking, saving, budgeting, and investing — as well as the wealth-building ideas of personal entrepreneurship. In just six weeks, Sethi’s plan is designed to help people: optimize credit cards, set up no-fee, high-interest bank accounts, open investment accounts with even small amounts of money, figure out current spending profiles, how to automate the new systems, and how to get the most out of the investment market. We’re always on the lookout for new ways to make easy money. Click here to see our recommendations. Work Less, Make More by James Schramko takes a lot of the advice he has honed over time running his successful business and hosting the Freedom Ocean podcast with Tim Reid. This is one of the best books on making money currently on the market. The book is extremely actionable and practical, with tips, tricks, and hacks to implement immediately. Some of Schramko’s recommendations are about how to build content, turn off the gurus, keep learning, and shut up and get to work. He doesn’t sugarcoat his message. Schramko also mentions the 64:4 effort approach, where you focus on completing 64% of your goals, without overwhelming yourself. His advice also has a more holistic approach as well, as he surfs every day to keep fit and clear-headed and recommends others keep fit as well. This is a book on making money unlike the rest. Pick it up now! Want to make some extra money with a side hustle or two? We can help! Click here. In his book, The Total Money Makeover, Dave Ramsey breaks down how you can take control of your money and build it up over time. With a “fitness” theme to turn those fat and flabby expenses into a well-toned budget, and your sad and skinny bank account into a bulked-up cash machine, this book is for those looking to transform the way their finances are working for them. Among other things, the book contains strategies for designing a sure-fire plan to pay off debt, recognize the 10 most dangerous money myths, and secure nest eggs for emergencies or retirement. This is one of the most helpful books on how to make money and money management that you’ll find on the market. For those looking to change how you make and save money, this is a must-read! Another one of the best books on money management is the classic, The Millionaire Next Door by Thomas J. Stanley and William D. Danko. In the book, the authors outline how the wealthy truly live. It’s surprisingly not in Beverly Hills or in huge mansions. Danko and Stanley found that in fact, those TV-type rich people were only a very small section of wealthy people. Instead, most of America’s rich were living right next door, rejecting a life of flashy exhibitionism, and raising their kids without them knowing just how well-off they truly are. Throughout the book, the authors outline seven common qualities that appear over and over in those of the wealthy demographic. Those qualities form how we — as entrepreneurs — should view, use and save money. Lauded as one of the best personal finance books to examine the actual lives of the wealthy in America, you will be amazed by what the authors have researched, found and outlined throughout the novel. Turns out that wealth isn’t a matter of flashing jewelry or expensive things; it’s more about building wealth quietly and living frugally, way, way beyond your means. Looking to make some extra money on your own terms? Click here for options. Perhaps the oldest book on this list, Wallace D. Wattles’ The Science of Getting Rich was originally published in 1910! However, this is one of the best books on making money and, as such, has held up remarkably well over time. Wattles argues that often it is how we are viewing the world and our position to money that is keeping us from making as much money as possible. In order to fix that, he outlines different ways that we should change our thinking. If you’re looking for a book about financial success, mindset, and transformative growth, then this is a time-tested classic you should get your hands on. Whenever you see best personal finance books lists, they often have this book on them — and for good reason! It has been around for over a century, and yet so many of its lessons are directly applicable to today’s money habits and mindframe. Making extra cash doesn’t have to be hard. Learn how you can make easy money now. Sean Whalen’s How to Make Sh*t Happen is a fast-paced book about how to maintain work-life balance, accomplish goals, and create a roadmap to making more money and taking back control in your life. Whalen starts off by asking: Is your daily life chaotic and out of control? Does it feel like there is never enough hours in the day to accomplish all of your goals? Does it feel like no matter how hard you try it’s never good enough? Do you struggle with work-life balance? For a book that’s unflinching, honest and will head-on ask you to question how you’ve been living your life and treating your finances, look no further. This book is for those looking to make a radical change right now. Take back control of your relationships with your body, your work, your relationships, and your money by reading this book. A great book about making money is Napoleon Hill’s Think and Grow Rich. The book details how people became so rich, going into the secrets to building a fortune. Originally published in 1937, the book investigates entrepreneurs, business people, and great minds to see how their minds and business practices were playing out to make millions. A time-tested classic, this book has sold over 70 million copies worldwide, ranking it amongst one of the best-selling self-help financial books of all time. The book investigates famously successful people such as Andrew Carnegie, Thomas Edison, and Henry Ford, just to name a few. Throughout the text, basic money-making techniques are outlined, including how to find freedom for your body and mind through building a lasting wealth in not only monetary terms but via relationships and introspective harmony as well. Don’t have a side hustle? Make some extra cash with these top tips and tricks now! If you’re looking for a great book on money management, consider Vicki Robin’s Your Money or Your Life. With more than a million copies sold and blurbed by Oprah, this book is all about our relationships with money. Some of the concepts detailed in this book include how to get out of debt, how to develop savings, good habits and mindfulness, decluttering your life, investing your savings, and more. This nine-step program teaches you how to live more deliberately and meaningfully while covering topics like index funds, managing revenue streams like side hustles and freelancing, tracking finances online, and having those difficult discussions about money. Robin’s book is for those looking to transform their relationship with money to achieve financial independence. It’s possible to be debt-free and money positive! With over 1.5 million copies sold, David Bach’s The Automatic Millionaire is a powerful book examining the money misconceptions we all hear and buy into in our daily lives. Bach, a self-made millionaire and financial advisor, has lived his message and gained considerable wealth. One of the main ideas of the book is that if you work eight hours a day, then at least one of those hours should be saved for yourself. He also gives advice on how to save money in order to make money, mainly in your 401k, Roth IRA, SEP IRA, and then table accounts. Bach’s message is that if you work, save one-eighth and live below your means, then you will be able to build a significant amount of money. So, if you’re looking for one of the best financial planning books about how to accumulate wealth via money management, this is the book for you. Looking for even more ideas on how to earn extra cash? Click here for some of the most lucrative opportunities! 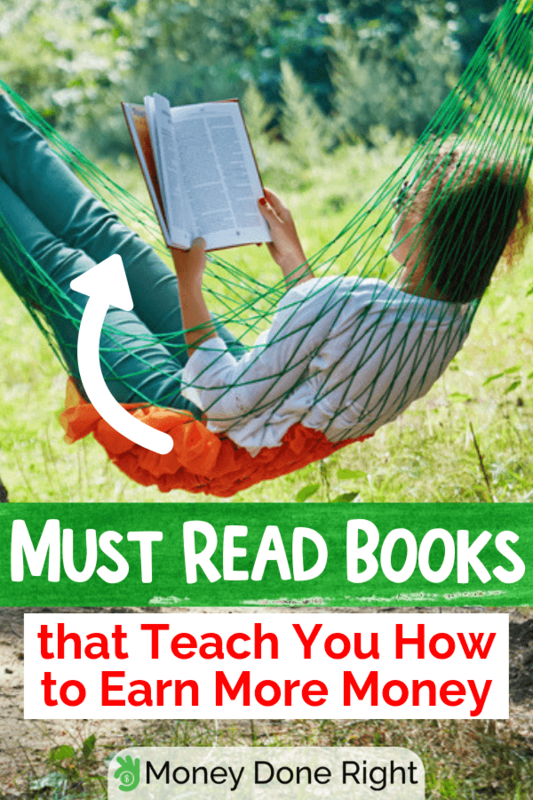 We hope you found a useful book or five on this list. What would be your picks for an all-time list of best personal finance books? Let us know down in the comments which books you’ve read, loved, and have helped you change how you handle money.